A fire fighting system covers usuallay the whole production area. There is a central fire fighting sytem, where the feed water is coming into the system. Next to a water tank the pumps are located to supply enough water when needed. A big pipe is installed around a production unit or an office building. In a refinery, a chemical plant or an offshore platform, the risk of a fire is higher, so the efforts to have a good fire fighting system are higher as well. In the so called wet systems, there is always water under pressure. In order to have in the case of fire, immediately enough water to fight the fire. As the water stand the most time in the system, such system tend to corrosion. During services, where some valves were opened and water flushed, the water often is dark brown. Which suggests that there is a certain corrosion in the pipes. 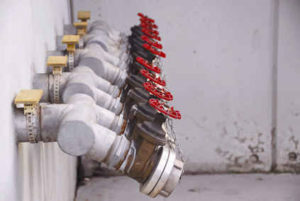 The higher the corrosion as higher the risk, that in the case of fire, the solved rust will clog the spray nozzles of the system and not enough water can flow. Usually ooe Merus ring is installed at the feeding pipe of the fire fighting system. Before the regular valve, the tank and the pumps. Such a pipe system is never absolute water tight. Means all the time a little water is leaking from the system. To balance this, there are small maintaing pressure pumps im the system to keep the pressure at the desgin pressure. Target of such a trail, is to remove the existing corrosion and prevent the system from further corrosion, by flushing out the rust. Direct after the installation a sample was taken at a shut off valve as far as possible away from the inlet. This was done with slow velocity, so the water was mainly clear. Some days later a second sample was taken at the same place and under the same condition. This time the water was dark brown. In the sampling bucket, there was after a short time a thin layer of rusty particles to be seen. The client wouldn’t believe, how much rust was in the system and how a aluminium ring several dozen meters away could solve all the rust in this short time. The system was cleaned by flushing water on several points in the system, until it gets clean. This was done four times, until no more brown water was coming. Nowadays this is a very common application for Merus, which we have done a lot of times. It has shown that this test is one of the most astonishing and fastest ways to show the client how efficient the Merus technology is working.